Here’s a repeat of a very good deal offered by Cabela’s. Today through December 16, 2009, you can receive $20 off any order of $100.00 or more. Just provide your email address and Cabela’s will send you discount codes to be used during check-out. This deal is “for real” — when Cabela’s ran a similar promotion in November this Editor saved $20 off a pair of boots. And this offer can be used whether you’re buying products for yourself or gifts to be shipped to someone else. Fine Print: This offer is limited to one per household per day. The $20.00 off promo can not be combined with any other Cabela’s offer, and it cannot be applied to prior purchases. Also this offer is for merchandise ONLY, it cannot be used to purchase gift certificates. Share the post "$20 off $100 (or more) Orders at Cabela's"
Over 260 rifle and pistol airgun shooters from across the United States, as well as 40 athletes from 11 countries around the world, will gather at the U.S. Olympic Training Center (Colorado Springs, CO), December 4-6 to compete at the 2009 USA Shooting Winter Airgun Championships (formerly known as 3 X Air). The 2009 Winter Airgun Championships will serve as a U.S. team tryout for 2010 ISSF World Cups, the 2010 World Championships (part I) and the Bavarian Airgun Championships in the Air Pistol and Air Rifle Events. For non-U.S. competitors only, this three-day event will serve as a minimum qualifying score (MQS) qualifier for the first-ever Youth Olympic Games, which will be held August 14-26, 2010 in Singapore. Identical competitions will take place in rifle and pistol with finals matches closing out each day of competition at the Winter Airgun Championships. Among the athletes competing will be two-time Olympic medalist Matt Emmons along wife his wife Katy Emmons, who is a three-time Olympic medalist for the Czech Republic. Two-time Olympian Jason Turner, who is the 2008 Olympic bronze medalist in Men’s Air Pistol, will also be shooting in the match. Colorado Springs Olympic Training Center Resident Athletes and 2008 Olympians Jamie Beyerle and Emily Caruso will be competing in the Women’s Air Rifle event. Vying for titles in pistol will be four-time Olympian Libby Callahan as well as three-time Olympian and U.S. Army Marksmanship Unit (USAMU) member Daryl Szarenski and 2008 Olympians Brian Beaman and Brenda Shinn. A full match schedule as well as complete results throughout the competition can be found by visiting USA Shooting’s website at www.usashooting.org. 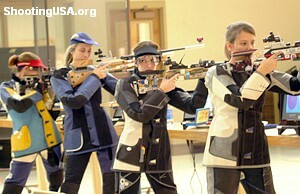 Share the post "Winter Airgun Championships Begin Friday, Dec. 4th"